The banquet included a tribute to Reserve Policeman George Booker Mogle, as presented by Commander Patrick Smith, Department Reserve Coordinator. The annual Twice a Citizen banquet was held on April 11 in the renovated ballroom of the Sheraton Universal Hotel, on top of the hill in Universal City. Reserve Officer Bertram N. Szathmary from Central Traffic Division was named Department Reserve Officer of the Year. 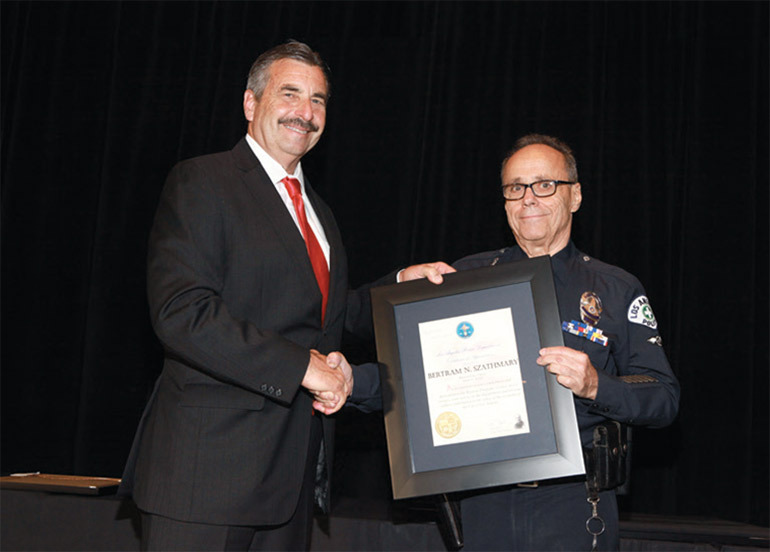 In his 32 years of service, he has made more than 1,600 arrests and received over 42 commendations. Prior to CTD, he worked Rampart Area Patrol for 20-plus years. He worked Vice, Gangs and Narcotics Units for over 10 years, in undercover and special operations, and has served as a training officer. Officer Szathmary also received the Central Bureau Award. 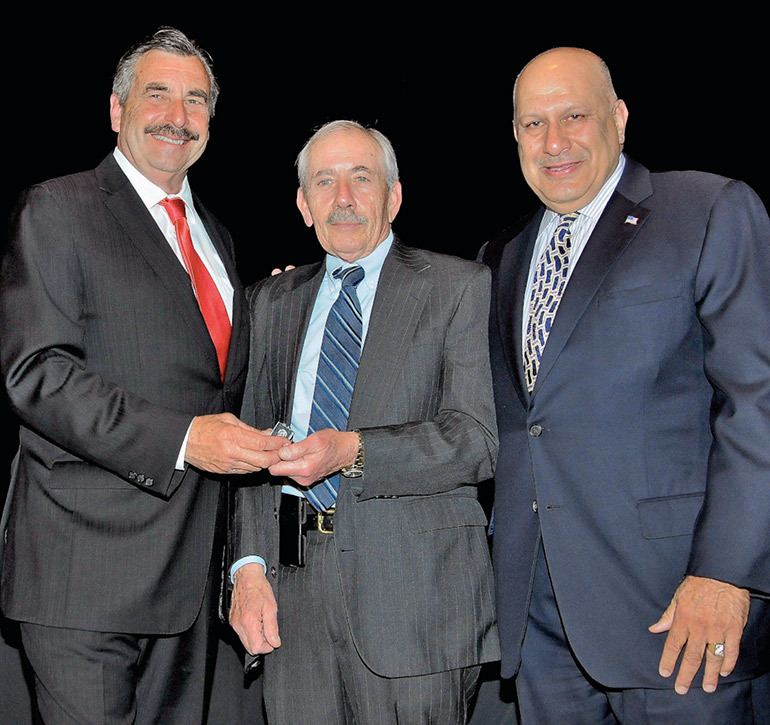 45-year service pins were presented to John Cresto and Dennis Zine. 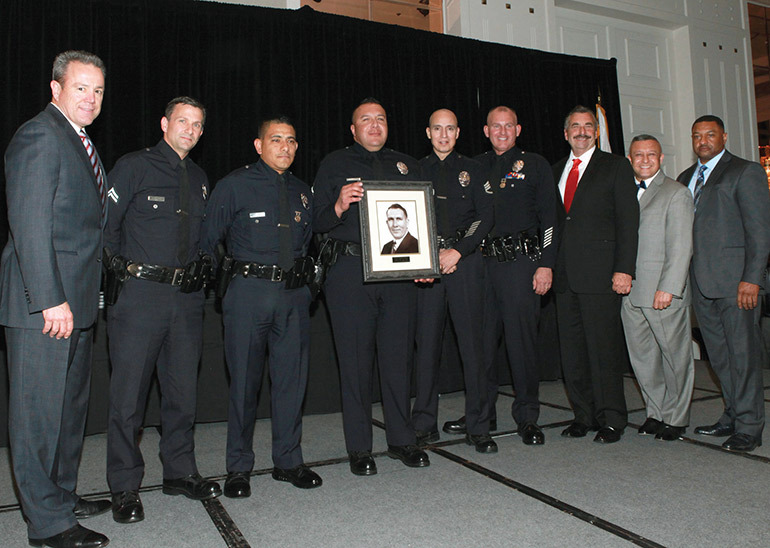 The other Bureau Reserve Officers of the Year were Reserve Officer Timothy D. Borquin (West Los Angeles Area) for West Bureau; Reserve Officer Douglas C. Webb (77th Street Area) for South Bureau; Reserve Officer Ismael Moreno (North Hollywood Area) for Valley Bureau; and Reserve Officer Warren D. Dern (Training Division) for Specialized Divisions. Service pins were presented to reserve officers with 25 or more years of service. Forty-five year pins were presented to Reserve Officers John Cresto and former City Council Member and retired Sergeant Dennis Zine. The second annual Andrea Friedman Award was presented to retired Assistant Chief Sandy Jo MacArthur, for going “above and beyond” in support of the Corps. The two other community leaders honored were Council Member Tom LaBonge, for his longstanding service to the City, and Ira Reiner, President and CEO of Homeland Security Advisory Council, who has also served in Los Angeles public office for over 15 years. Reserve Officer of the Year Bertram N. Szathmary accepts his award. The new Department Reserve Coordinator, Commander Patrick Smith, gave a heartfelt speech paying tribute to Reserve Policeman George Booker Mogle, who is known to be the first LAPD reserve officer killed in the line of duty, in 1946. Commander Smith revealed a portrait of Policeman Mogle to be hung in the offices of the Reserve Unit. It turned into a star-studded evening, as the cast of the TV series Major Crimes hosted the festivities. And they enthusiastically bid on auction items, helping to raise much-needed funds for the Corps. 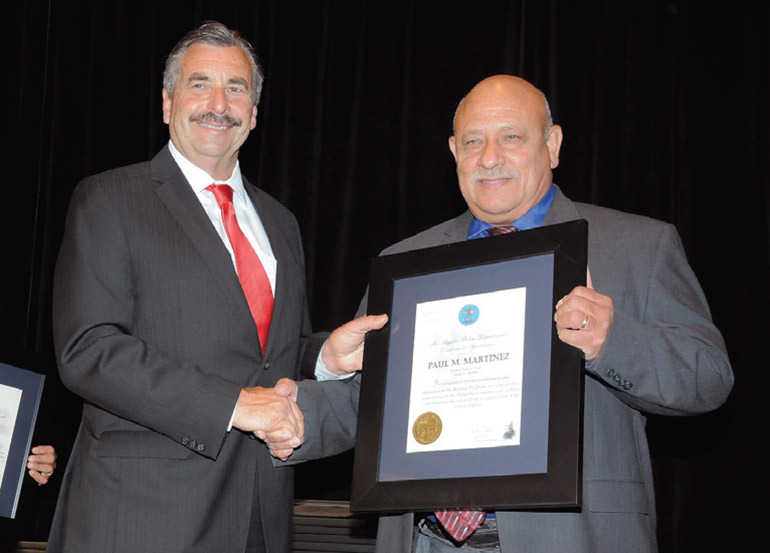 Paul Martinez, Hollenbeck Area’s Reserve Officer of the Year. Members of the Martinez family have served in the Reserve Corps for a combined total of 100 years. Auctioneer duties were handled by Kelley Nelson. The annual banquet is funded by the Los Angeles Police Reserve Foundation. The Foundation extended special gratitude to: The Ahmanson Foundation; Andrews International; Ambassador Frank and Kathy Baxter; Council Member Joe Buscaino; Mark Deitch and 911MEDIA; Council Member Mitchell Englander; Fazio Cleaners; Robert and Judy Flesh; The Frandzel Family; Galpin Motors; Rickey Gelb and the Gelb Group of Companies; Gary and Linda Goldfein; Council Member Tom LaBonge; Lattie, Malanga and Libertino LLP; Los Angeles Police Command Officers Association; Los Angeles Police Federal Credit Union; Los Angeles Police Protective League; Peter Lowy of the Westfield Corporation; The cast and producers of Major Crimes (including James Duff, Robert Gossett and Phillip Keene); Barry Maiten; John Moriarty; Peter and Merle Mullin; Petersen Automotive Museum; Ms. Kelley Nelson; Ira Reiner; The Resnick Foundation; The Riordan Foundation; Michael Rosson and California Supply; Bobby Sherman and Volunteer EMT Foundation; Shiny Objects; Neil and Elaine Simon; Turner Broadcasting System; Walter Wang and JM Eagle Inc.; and Scherr Lillico and The Proper Image Special Events. To see more coverage and photos of the event, visit our Facebook page at www.facebook.com/LosAngelesPoliceReserveFoundation.